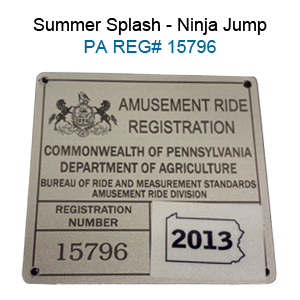 The 23′ Wet/Dry Slide is licensed and registered in Pennsylvania. Please click here for pricing and availability. The 23′ Wet/Dry Slide is the perfect addition to any summer party, or to bring some sunshine to any celebration! The slide takes participants up a right-sided climb, to a roomy left-sided fast slide that puts riders in a puddle splash with a safety bumper wall. Riders climb to 14 feet, where a No-Jump Top makes them slide down correctly, keeping them safe and secure. A friendly red and yellow theme lets the Summer Splash fit in to any décor and is sure to make a eye-catching addition to any party rental or playground.